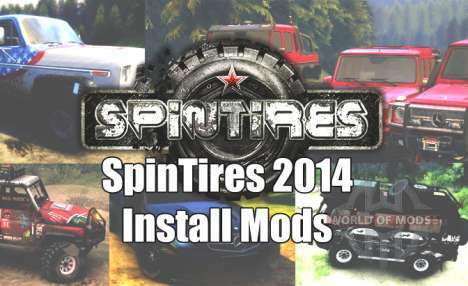 Unfortunately, mods for demo version of the game Spin Tires are not suitable for full version. But the authors of the mods have already started to publish adapted modification. Each mod, published on our website is applied installation instructions. The following is detailed instructions how to install mods. Unfortunately, convenient functionality for modifying the game developers are not provided, so mods placed on the replacement of the existing in-game objects. There are many such games, so don't worry. 2. Copy the contents of the archive (if it's not automatic installer) to the root folder of the game. 2.1. If the archive contained auto installer, you need to start and select the manual mode. In this case, the selected folder will then extract the files modification that you want to copy into the folder with the game. 3. Start the game and enjoy a freshly installed the mod. Possible problems with textures. This is because the game does not recached textures of mod. This problem is solved by manually placing textures (files from the folder /textures/ mod files in the archive TexturesCache.zip in the root folder of the game. Play online with friends in Spi Tires 2014.